It was like carrying a pet snake into a room full of people. It's always fun bringing this guy, Bulbophyllum grandiflorum, out of the backup greenhouses and into the Orchid Display House. Our Cobra makes friends easily, in spite of its menacing appearance. 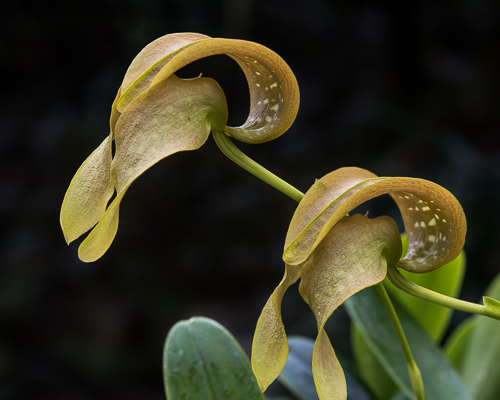 The genus Bulbophyllum has been described as the Old World counterpart of the neotropical genus Pleurothallis, at least with regard to pollination. 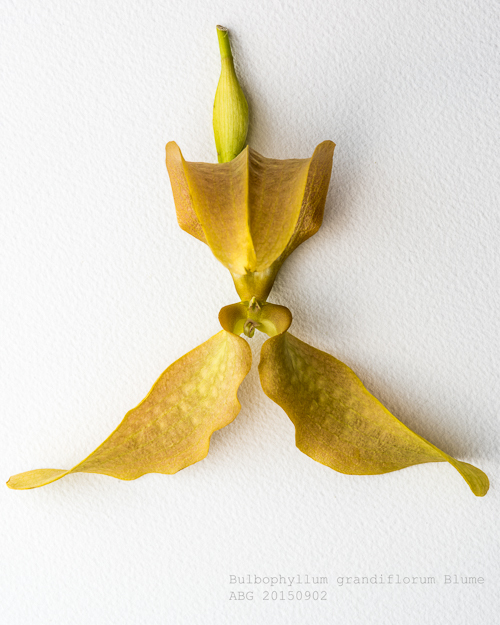 Bulbophyllum species have some of the same lures in their floral tacklebox: waving hairs, mobile appendages, red splashed carrion colors, the odor of decaying flesh. The lures attract flies who pollinate the flowers. Notice the translucent 'windows' (fenestrations) on the dorsal sepal? 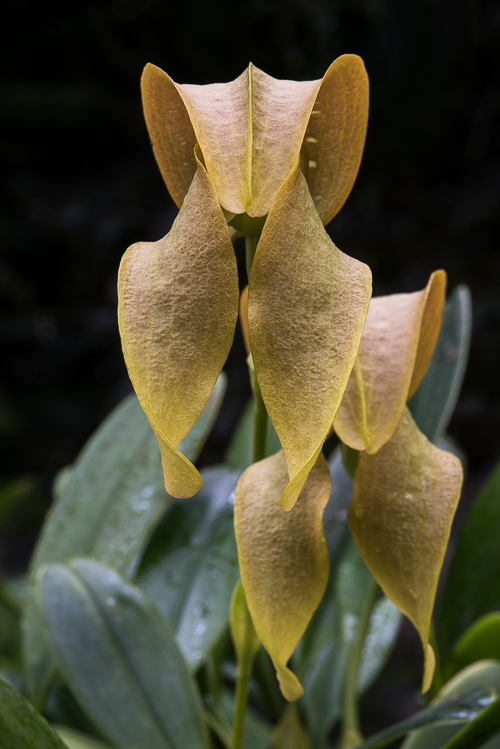 Bulbophyllum grandiflorum shares this feature with some unrelated insect-trapping plants like Sarracenia minor, Darlingtonia californica and Nepenthes aristolochiodes. An insect trapped inside the flower (or pitcher) flies toward the light source, crashes into the back and falls toward the pollen source (or digestive juice) below. 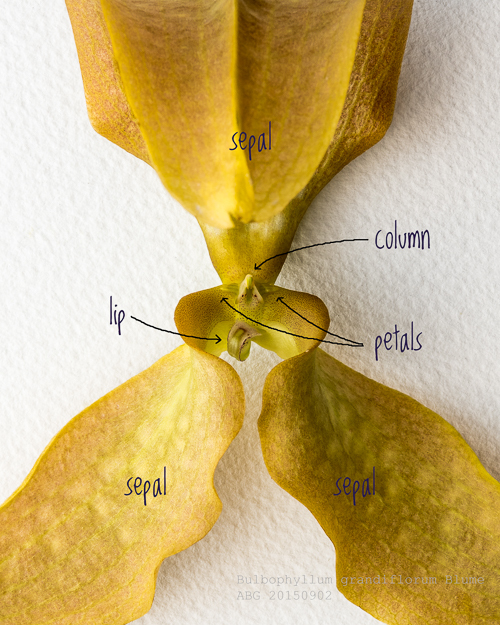 Wondering what's inside the flower? Here's a closer look. 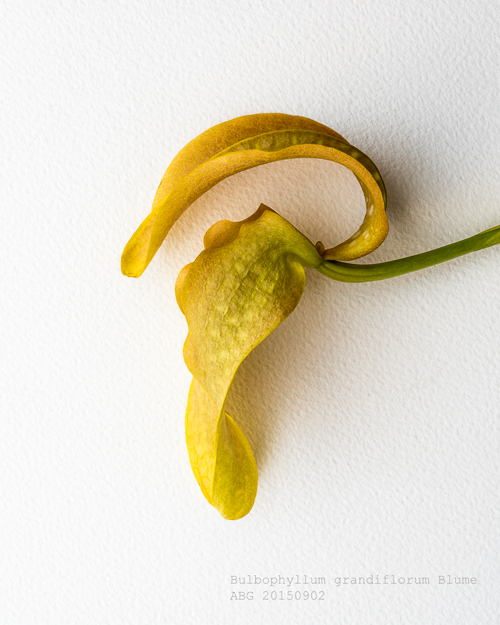 The huge sepals are what give this flower its hooded cobra-like appearance. The petals are tiny by comparison. The lip, which has a lovely fringe of purple hairs, is hinged -it is connected to the base of the column by a narrow flexible ligament that allow the lip to tip like a seesaw under the weight of an insect. As the insect redistributes its weight, the lip tips up, slamming the insect against the column and releasing the pollinarium onto the insect's body. I was surprised to see that the lip flexes not only up and down, but also laterally, as you can see in the photo above. I'm not sure what purpose this serves, if any. 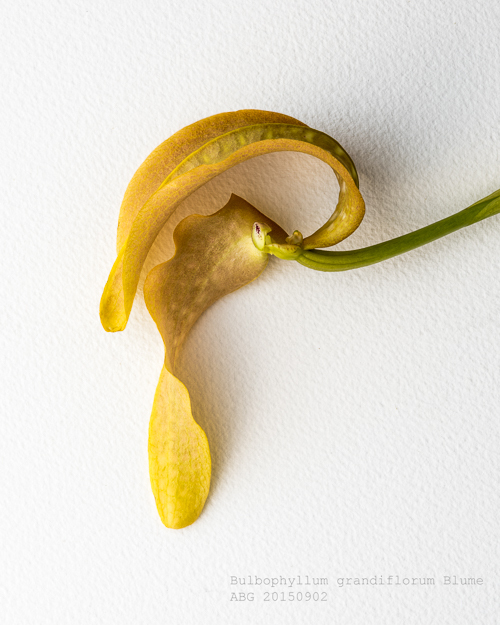 Here's the flower with one of the lateral sepals removed. From this angle, you can see that the lip, which has purple spots in its center, is oval and concave like a drum. It is turned slightly away from the viewer. This lateral movement to the right and left was persistent and it was present in all the flowers on this plant. 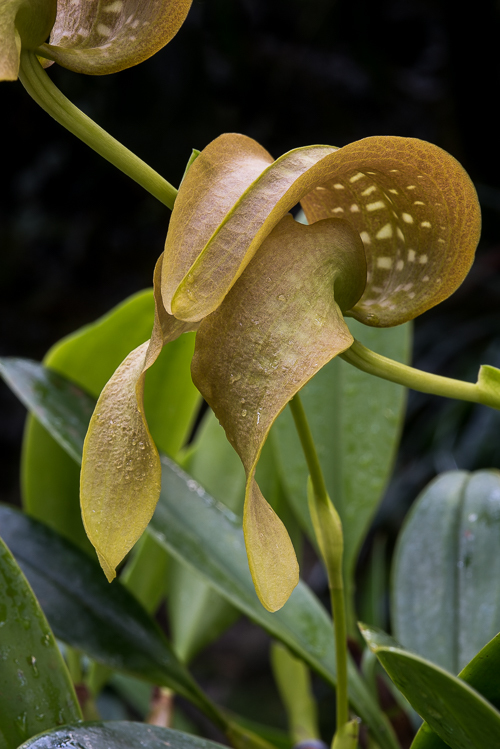 The genus Bulbophyllum is so large that it has been divided into sections. Bulbophyllum grandiflorum is just one species in Bulbophyllum section Hyalosema. There are more cobras! You can find pictures of them at Jay Pfahl's website.